This is a short story about how Charles Oropallo and Susan Oropallo came to adopt the newest member of their family, Bonnie, who would lovingly come to be known as Bonnie Oropallo. 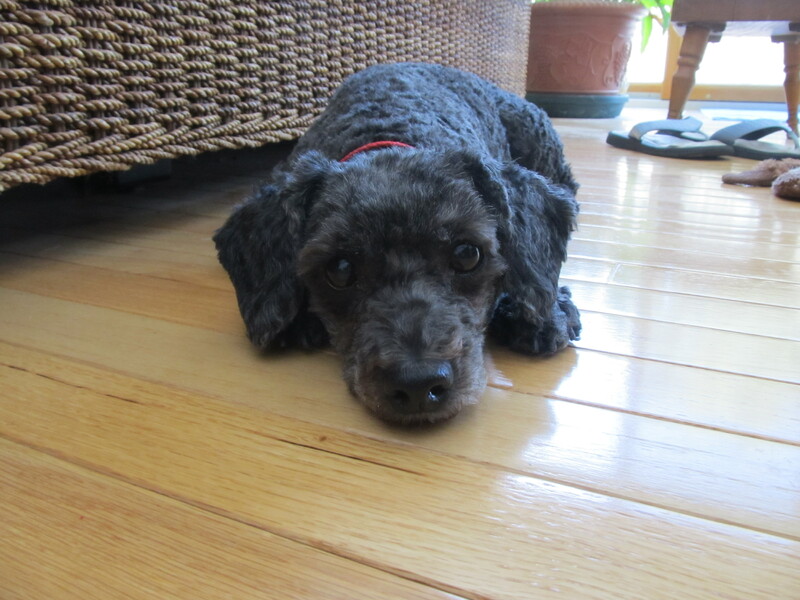 Bonnie is a graying, roughly fourteen pound miniature poodle mix. She has a wonderful disposition. Bonnie was born on March 31st, 2008 in the Land O’ Lakes, Florida area. Charles’s mom, Arlene deSousa, fell in love with her as a puppy. Arlene had raised her since she was only a couple months old. At that time she lived with her husband, Mario deSousa, in their home in Land O’ Lakes, Florida. In the photo above, Bonnie is shown with a little longer hair in the somewhat stereotypical poodle cut many people recognize. Arlene deSousa almost always had her groomed in that fashion. Arlene deSousa with Bonnie on Christmas Day of 2015. Photo by Charles Oropallo. 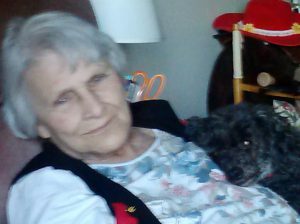 When Arlene deSousa moved to the Renaissance assisted living community in Tampa, Florida, she moved Bonnie along with her. The facility had many seniors as residents. Bonnie became used to being around a large number of different people and varying personalities in that new environment. Everyone at the facility always appeared to love having Bonnie around. Whenever Susan and Charles visited they would take Bonnie out for walks and it seemed everyone knew Bonnie by name. Bonnie was always extremely friendly and great natured to everyone she came into contact with. Bonnie Oropallo relaxing on a warm floor – she’s gotta be thinking there’s just nothing like radiant floor heating! Photo taken in 2016 by Charles Oropallo. In April 2016, Charles Oropallo’s mom, Arlene deSousa, was temporarily moved to a nursing home in Tampa, Florida. It was supposed to be a short stay while she convalesced in order to return to the Renaissance assisted living a facility she resided at. 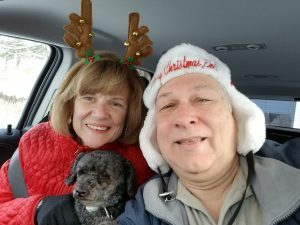 Arlene asked her son Charles if he would mind just temporarily bringing Bonnie, then an 8 year old miniature poodle, to visit with him and his wife, Susan Oropallo, until she could get back to her home. Charles and Susan had to think about this, as they had been twenty plus years enjoying total freedom from children and pets! But they agreed they’d watch Bonnie long enough for Charles’s mom to return home. Bonnie Oropallo’s long trip from the Tampa, Florida area to her new Peterborough, New Hampshire residence. 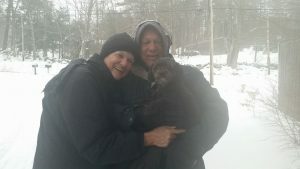 To visit with Charles and Susan Oropallo, Bonnie had the opportunity to enjoy the very long ride from Tampa, Florida, all the way north to Peterborough, New Hampshire. Charles was not certain how often Bonnie would need to stop along the way. To be on the safe side, they stopped about every few exits. This made for a very long trip back – and Bonnie loved the trip. With her arrival in Peterborough, New Hampshire, Bonnie went from two rooms where she lived in an assisted living facility in Tampa, Florida, with Charles’s mom to more than ten rooms spread out over three floors in Susan and Charles’s home in Peterborough, New Hampshire. Susan and Charles were surprised to discover Bonnie actually did not know how to use stairs. This presented a problem with there being two full flights of stairs between the three floor home she now had the run of. One that Bonnie quickly overcame! In June of 2016, Charles Oropallo and Susan Oropallo took Bonnie with them for a ride to visit Arlene deSousa at the nursing home she was in. Bonnie got to see Arlene just before Arlene was taken to an intensive care unit. Unfortunately, Charles’s mom, Arlene deSousa, passed at that time. Her obituary can be seen on the Cheshire Family Funeral Home website. Susanand Charles had become very attached to Bonnie by that time. So Bonnie officially became adopted by Charles Oropallo and Susan Oropallo. It was very apparent for many, many months that Bonnie missed Arlene very much. But ultimately, Bonnie became part of the Oropallo family. We refer to her as Bonnie Oropallo now. And Charles and Susan could not imagine Bonnie not being there with them. Here are a couple weather widgets showing the current weather in Peterborough, New Hampshire and the current weather in Tampa, Florida. Susan Oropallo – Charles Oropallo – Bonnie Oropallo during a January 2017 nor’easter blizzard in Peterborough New Hampshire. Photo by Robin Snow. As far as Susan and Charles Oropallo know, Bonnie had never been in the snow before. The winter season of 2016-2017 in Peterborough, New Hampshire was probably her very first as far as was known. Very much to Susan and Charles Oropallo’s surprise, it appears Bonnie really loves the snow. Go figure! But then again, she doesn’t have to clean it, plow it, snow-blow it, or otherwise have to deal with it in any fashion other than playing in it and walking through it. Her favorite past time in the snow is climbing up snowbanks. Susan Oropallo, Bonnie Oropallo and Charles Oropallo going to friends Pat and Keum’s home on Christmas Day 2017. Photo by Charles Oropallo. One of the great things about the New England area is the sheer beauty of the winter season. This area of the country is certainly wonderful at Christmas time. Spending Christmas with friends is a wonderful thing to do during weather like we have. The New England winter season is incredibly beautiful. However, that awesome beauty can be offset by the bitterness and cold that can happen during the winter time here. During the 2017-2018 winter season, we got some really cold weather in between Christmas and New Years. Bonnie has a very difficult time during this kind of weather. 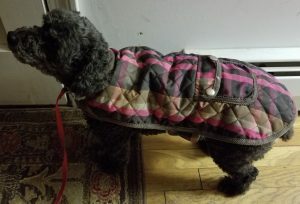 Bonnie in her new coat waiting to go out 12/27/2017. Photo by Charles Oropallo. Initially, we have tried a few different doggie garments to help keep Bonnie warmer outside in the worst of our winter weather. The first line of winter defense is to allow her hair to grow out during that time of year. Bonnie is a roughly 14 pound miniature poodle mix. We normally keep her cut very short. Bonnie would normally need her hair cut about every 30-60 days. 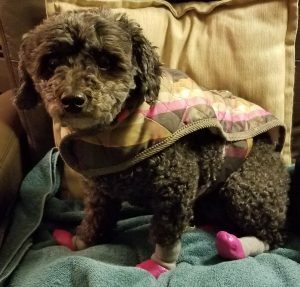 Bonnie with her new booties 12/28/2017 in well below zero weather. Photo by Charles Oropallo. In the photo above, Bonnie has her 2017 Christmas jacket on. She is okay when putting it on – but is not happy when removing it. Charles thinks it’s the sound of the Velcro that she reacts to. When Charles or Susan undoes the Velcro slowly to avoid one loud sound, Bonnie is absolutely fine with it. It does not take long before Bonnie starts limping from walking outside in the near zero degree weather. So Susan solved the problem totally by getting Bonnie a set of booties to wear. 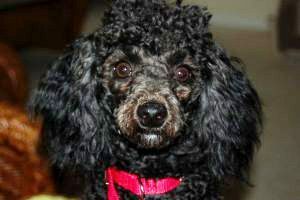 And if you think Bonnie looks a little like a poodle with an attitude in the picture above, you’re probably right! At first she didn’t seem to like them one bit – but we were amazed we could even get them on her and she didn’t try to remove them. Bonnie is such an even natured, trusting little dog! Bonnie getting ready for a sub zero weather walk in southern New Hampshire 12/29/2017. Photo by Charles Oropallo. You really have to see Bonnie in these to believe it. But the booties really made the difference! 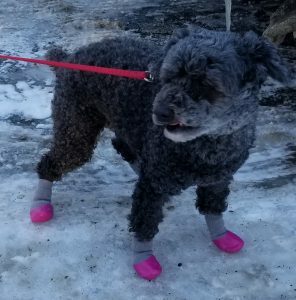 Bonnie was able to stay outside without limping and able to do her business even though it was below zero (-9° Fahrenheit outside) when this photo with Bonnie in her booties was taken. Although Bonnie does not usually go outside in the extremely cold weather, she can do so much more comfortably wearing her protective gear. It takes Charles and Susan about five minutes to get Bonnie ready. Bonnie got used to wearing these very quickly, although Charles and Susan are very sure she’d rather not! Bonnie Oropallo thinking: “C’mon, it’s time to go for a ride!” Photo by Charles Oropallo. What does Bonnie seem to love the most? Going for a ride in any of the Oropallo’s cars – or anyone’s for that matter! Short rides or long ones – Bonnie gets crazy excited when asked if she wants to go for a ride. What Bonnie thinks is happening when it’s time for a ride only she knows for sure. She seems to just want to go wherever someone else wants to go. However, the strangest thing happens when Bonnie goes for a ride. She just wants to lay down and nap. 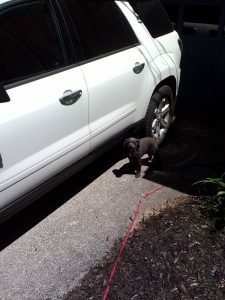 But to Bonnie’s credit whenever the car stops she gets up and takes a peek around to see where we are. Probably in case she’s going to go for a walk someplace different. After all, there’s nothing in the world like peeing and pooping away from home! After the wonder of going for a drive anyplace, going out for walks is Bonnie’s next favorite thing to do. Susan Oropallo walking Bonnie in Tampa, FL on Christmas Day of 2015. Photo taken by Charles Oropallo. When Bonnie resided with Charles Oropallo’s mom, Arlene deSousa, her time outside – and where she went – was rather limited. Bonnie’s walks took place in the front of the Tampa, Florida assisted living residence that Arlene and Bonnie lived at. Arlene used a motorized chair to get around so that situation was not going to get any better. Bonnie liked when Susan Oropallo or Charles Oropallo took her for walks when they visited because the walks were more substantial. Since Bonnie’s move northward to New Hampshire to live with Susan and Charles Oropallo, she has gotten way more exercise than she ever had in her life. Bonnie gets walks around the block that are a mile and a half at a time. Bonnie seems to be in great health, as attested to by her appointments with the local vet, Dr. Charles Devinne, and his great staff at the Animal Care Clinic – Monadnock on Route 202 (Concord Street) in Peterborough. Dr. Devinne has told Charles that whatever we are feeding Bonnie we should continue with.